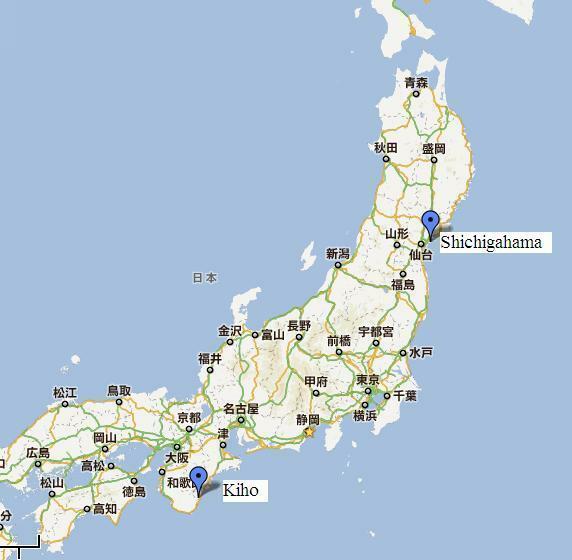 On November 5th, 2011, Ms. Shimizu and I visited Kiho Town, Mie Prefecture, which had been struck by the typhoons No.12 and No.15 in early September 2011. Ms. Shimizu is a local volunteer staff member in charge of Ashiyu (footbath) service at the RSY Kizuna-kan Volunteer Center in Shichigahama. 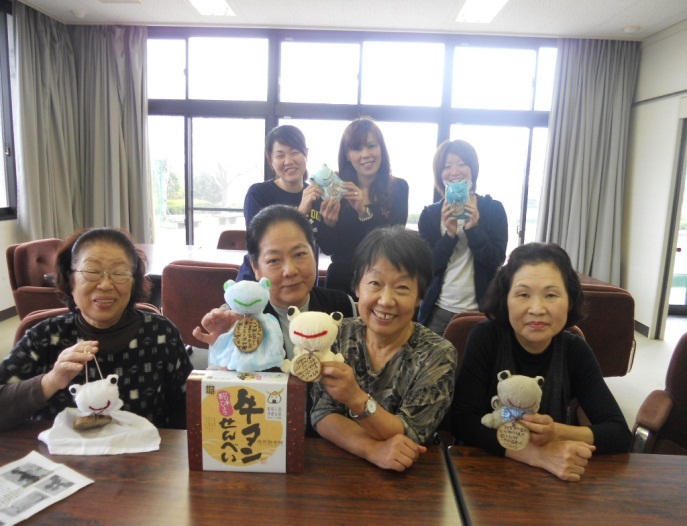 Residents of Shichigahama made some hand-crafted goods for the typhoon victims in Kiho. We helped deliver these goods to the victims in Kiho. In the middle of September, when we, the RSY staff started support activities in Kiho for residents who had to evacuate because of the typhoon damage, we saw evacuees physically and mentally exhausted. At the moment, a bright idea came to my mind; our Ashiyu service, which we had been offering in Shichigahama since the tsunami disaster, might be helpful for these typhoon victims as well. After discussing with Mr. H, Vice Manager, and Ms. T, a staff member of Kiho Disaster Volunteer Center, we were approached by some members of a local women’s volunteer group who said. “We want to do whatever we can, though we may not be so strong”. These women helped provide Ashiyu service as volunteers in the evacuation shelter in Kiho from September 22nd to October 11th. During this visit, we had an opportunity to exchange opinions with four board members of the women’s volunteer group. We shared our ideas and thoughts on the Ashiyu activity including i) our nervous feelings when we actually offered Ashiyu to someone for the first time, ii) evacuees’ comments that left a lasting impression and iii) any creative efforts that were made to improve the service. ・ I didn’t know what to speak to evacuees when I offered Ashiyu for the first time. What I could do was just to hold their cold hands. But an elderly lady around 80 years old thanked me in tears saying, “I’ve never received such a warm and comfortable service in my life”. I felt very happy to be involved in this activity. Moreover, I was very moved that she was able to express her appreciation to us in such kind words , even though she is enduring hardships herself. ・ It struck me that some evacuees, whom we had already met a few times before, would tell me what happened to them in the disaster as if it was their first time to tell the story. I was also shocked to hear that so many of them had barely escaped. ・ I still keep in touch with some people to whom I offered Ashiyu even after they moved out of the shelter. We would have never known each other if I hadn’t engaged in the Ashiyu activity. I also sometimes think of other people I met and wonder how they are doing now. ・ Ashiyu is a good opportunity to meet people and get to know each other. Currently, a total of about 30 evacuees live in three shelters. Most of them are going to live in the shelters until they find new housing or their houses are restored. 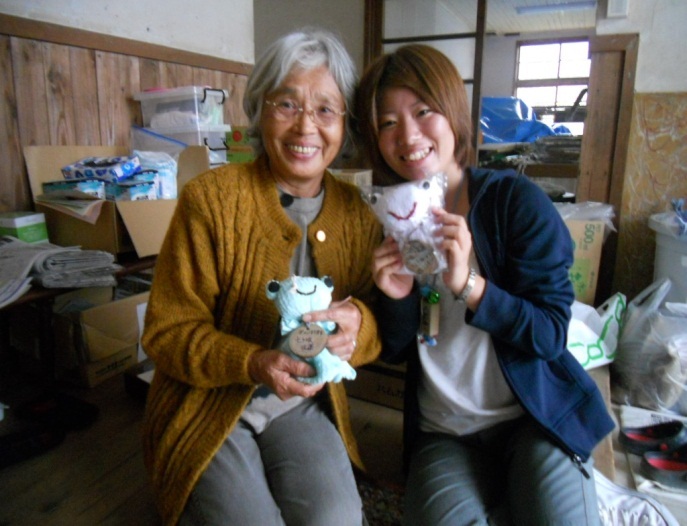 Though many evacuees were away for work or cleaning up their houses when we visited them, Ms. Shimizu handed out handmade frog dolls [i] and cherry tree key chains to residents of the shelters saying “with best wishes from Miyagi”. ・ My house was washed away and I have no place to live. But I will move to an apartment soon. I was once offered a two-story apartment, but I turned it down because it would not be easy for me to go up and down the stairs. My house was about 150 years old and very big. Maybe five or six generations had lived there. Almost all neighbors were my relatives, but mudslides totally destroyed all their houses. I was totally devastated. I don’t think I can recover from this. But I could say I helped everyone. I mean, when water came into my house, I instantly noticed that it was a discharge of water from the dam. I woke up all my family and fled by car to the mountain. In the mountain, the ground shook a lot because of the landslide. But looking back, it’s as if the water saved us. If I hadn’t noticed that, we might have got caught in the mudslide. I lost everything, but I miraculously found my letter box later. I will write to you, so please tell me your home address. I hope my letter will be delivered to your home before you arrive back. I’m alright, so don’t worry about me. ・ I lived alone and fled to the mountain with my dog. I was soaked to the skin because of the heavy rain and was very scared because it was pitch dark at midnight. But I felt all right with my dog by my side. As it’s not allowed to have a dog in the shelter, he stays at my house now. My house has been all repaired except its ceiling. Oh, I’m sure that everyone will love this doll. Thank you. [i] About the f rog dolls: Frog is Kaeru in Japanese. Kaeru has the same pronunciation as the Japanese words for, to return, recover and revive. 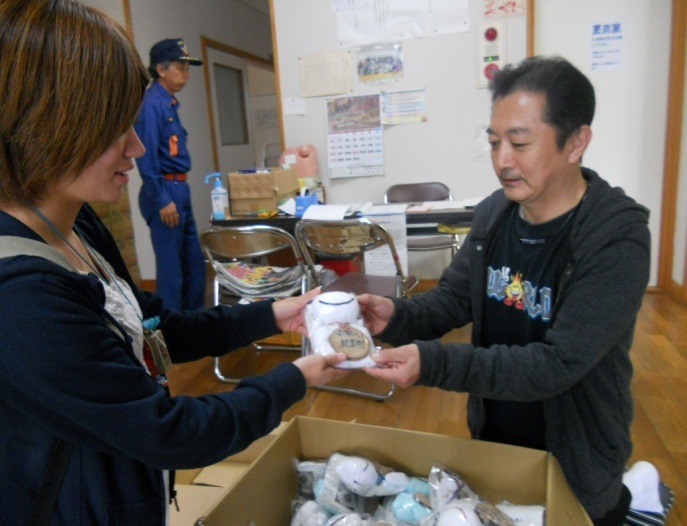 The residents in Shichigahama, Miyagi Prefecture made the frog dolls with sincere wishes that the victims in Kiho will be able to return to their home and recover or revive their lives. As I am reading this latest Voices article, I'm also listening to public radio here in the US.... all about politics and public policy. We, in America, are so caught up in our own little news-filled world. When we hear international news, it's too easy for us to tuck it away in the far places of our minds. It becomes news in the abstract. In our minds we say, "too bad; so sorry." and we move on. Now I read this wonderful article and I see a human face to this news. How real and current is the plight of Kiho; how personal is the pain. And again, how wonderful is the Japanese spirit. Voices from the Field opens up my mind and allows me a broader understanding of my own place (and my country's place) in the world.